Oh, how I love the library! I love searching Polaris late at night, looking for old treasures buried at some branch or other. 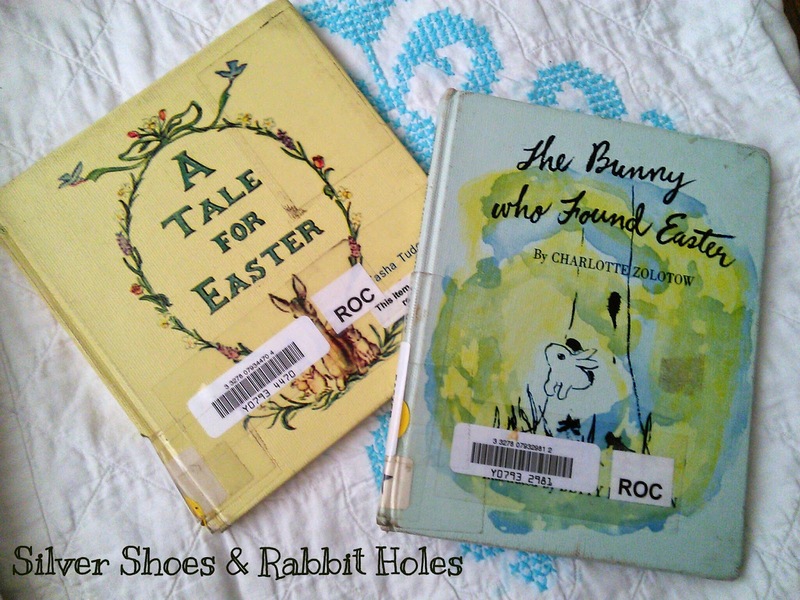 Today I have two adorable vintage Easter books, written by two wonderful authors, Tasha Tudor and Charlotte Zolotow. 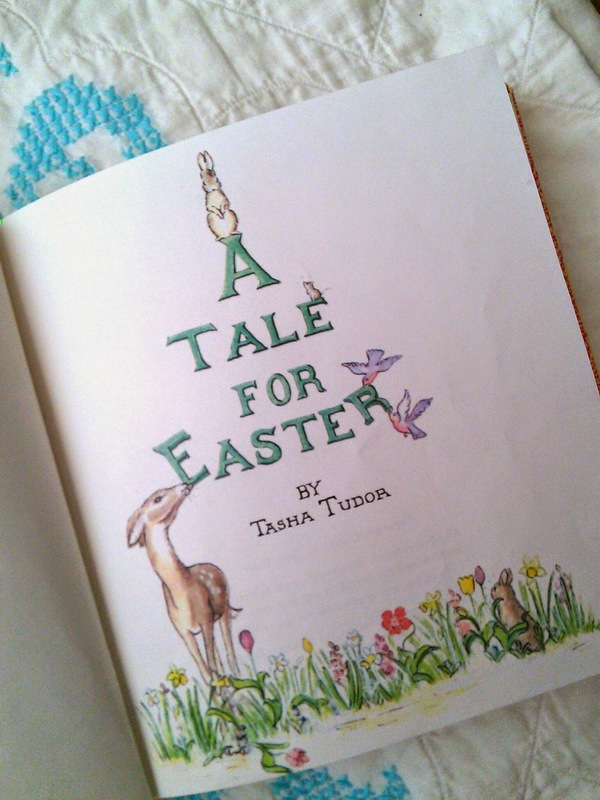 A Tale for Easter by Tasha Tudor. The book then ventures into Dreamland. "If you have been very good the whole year through, the night before Easter you will dream the loveliest dreams." And she isn't kidding. In her dreams, you ride on the back of a beautiful fawn, who shows you rabbits, sweet little mice, adorable lambs, and Easter ducklings. 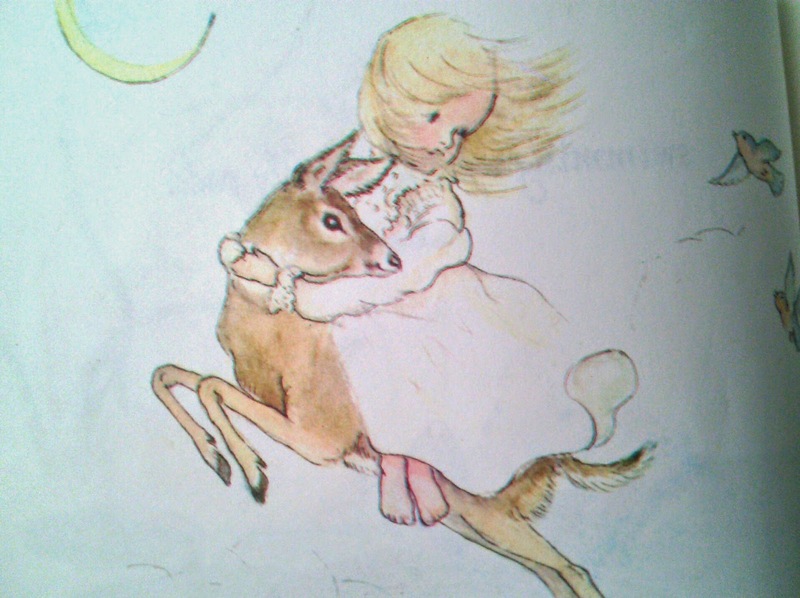 Then the fawn takes you flying, because this is the most beautiful Dreamland ever. 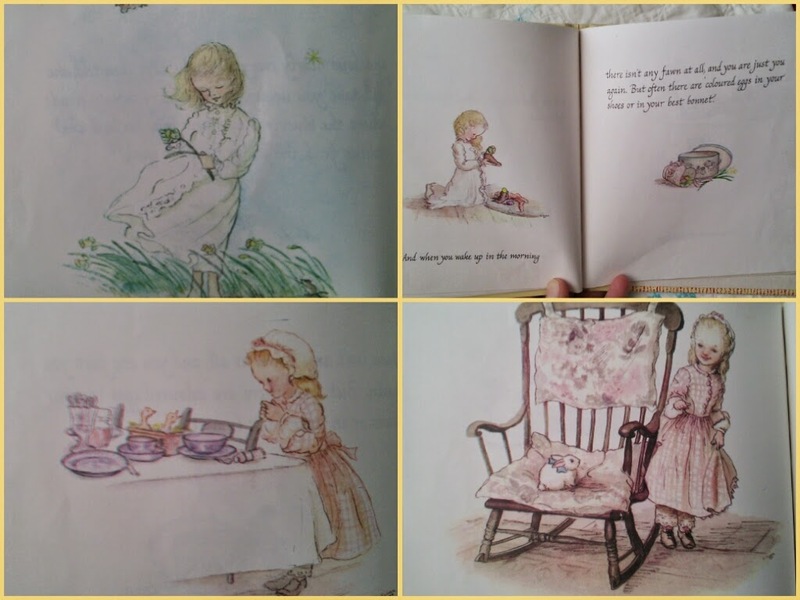 When we wake up, we may have left Dreamland, but we're still in the world of Tasha Tudor, where Easter morning brings colored eggs "in your shoes or in your best bonnet;" a basket of ducklings "beside your bowl of porridge;" or a bunny "in Grandma's rocking chair." Sigh. I want to live in a Tasha Tudor book, if only for one day. Our next book was written by author and editor extraordinaire Charlotte Zolotow, who passed away late last year. The beautiful spring-hued illustrations are by Betty Peterson. I tried to find information about Betty Peterson, but this book seems to be the only one I could find. Houghton Mifflin Harcourt has republished the book with all-new illustrations by Helen Craig, of Angelina Ballerina fame. I love Angelina, but I think I prefer the original Bunny Who Found Easter. 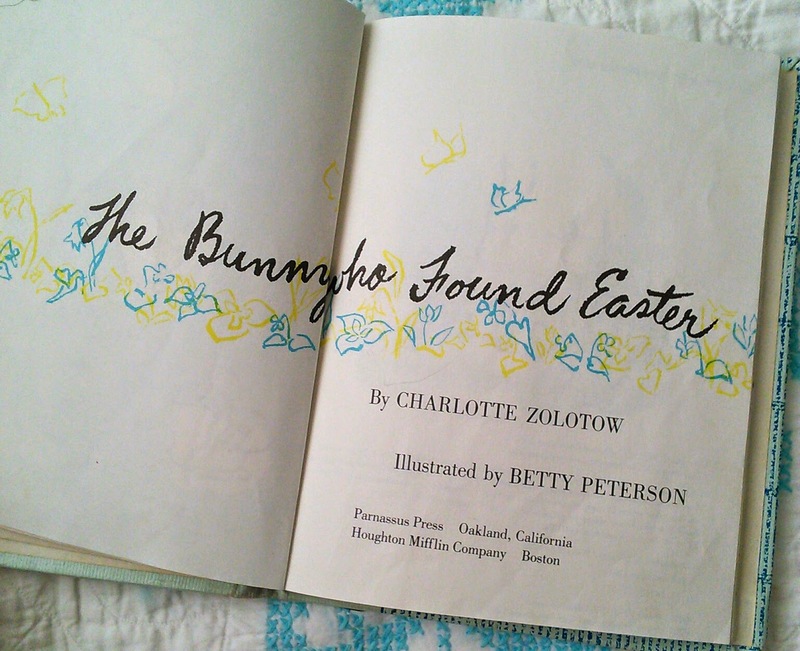 The Bunny Who Found Easter by Charlotte Zolotow, illustrated by Betty Peterson. Parnassus Press / Houghton Mifflin Company, 1959. You can find used copies of this version at Amazon. 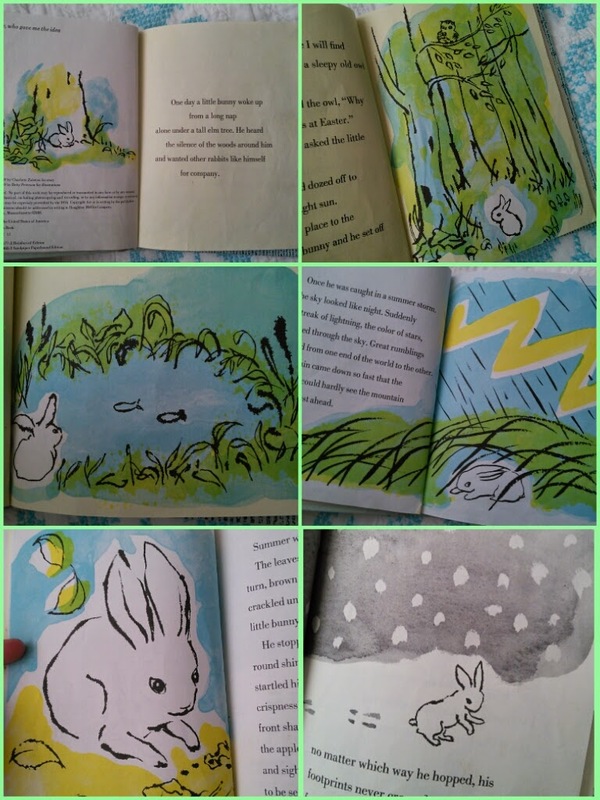 HMH Books has a current edition, with illustrations by Helen Craig - see here. A little bunny wakes up from a long nap, and longs to play with other bunnies. He asks the owl in the elm tree where he might find some. The owl tells him, "Why there always rabbits at Easter." 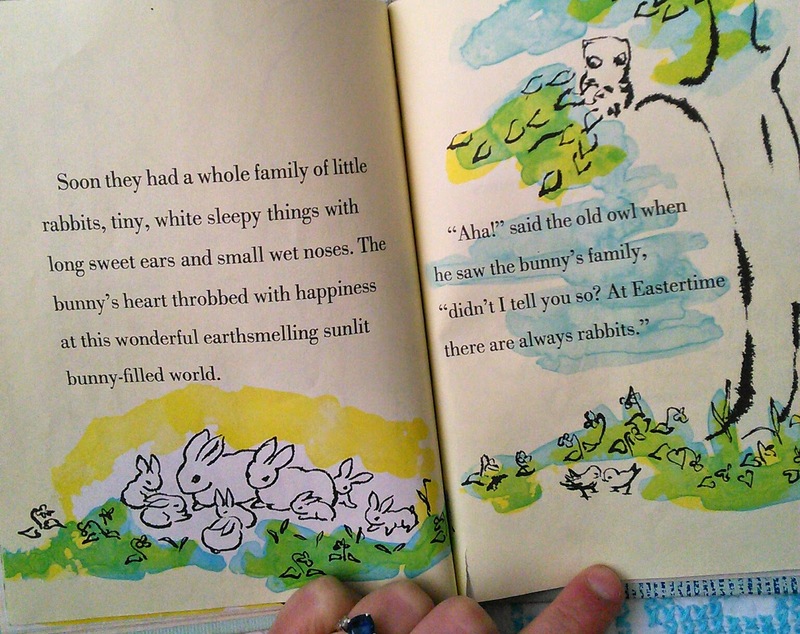 The bunny doesn't know what Easter is, and the owl falls asleep without telling him. The bunny thinks Easter must be a place, so he sets off - headed east - to find it. He finds a pool of trout and a field of daisies. He gets caught in a summer storm. He finds mountain laurel, wet from the rain. Nowhere does he find another rabbit, though. Sadly, he crunches an apple as the air starts to smell of autumn. One day, the snow begins to fall. He sees other animals preparing for winter, but still no rabbits. The lonely rabbit curls up inside a hollow tree to sleep. When the bunny wakes up, spring has arrived! He begins hopping about, ready to resume his search for Easter. He comes across paw prints - familiar paw prints, much like his. He follows the paw prints until he finds another white bunny, bright-eyed and white, just like him. He forgets all about his search for Easter. All he wanted was another rabbit for company. The two rabbits are very happy together, and as you see in the picture below, they start a whole family of rabbits. The old owl has the last word. "Aha! Didn't I tell you? At Eastertime there are always rabbits." 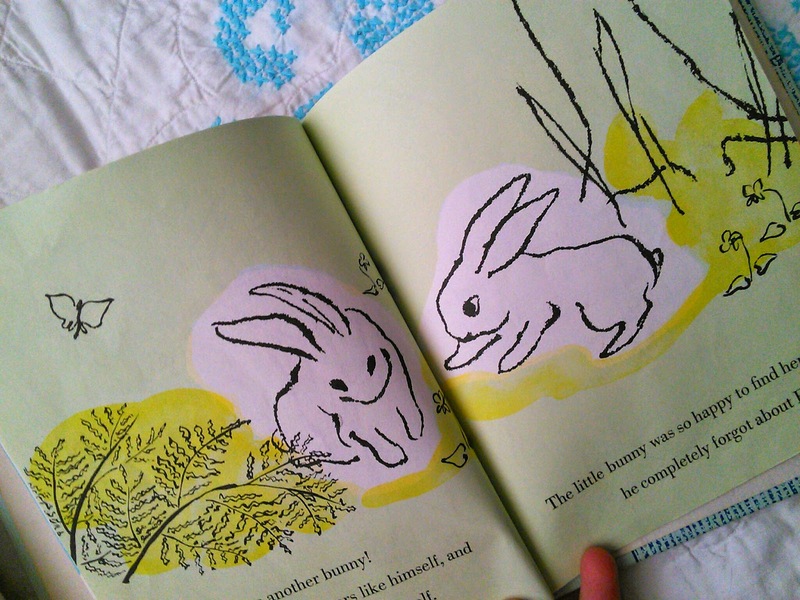 The bunny felt his little bunnies around him and the earth blooming beyond them, and all things growing. And he understood at last that Easter was not a place after all, but a time when everything lovely begins once again. I will have more vintage Easter goodies to share tomorrow! These books are absolutely adorable! They are both so sweet. I've realized that we don't have very many Easter books in our home library. 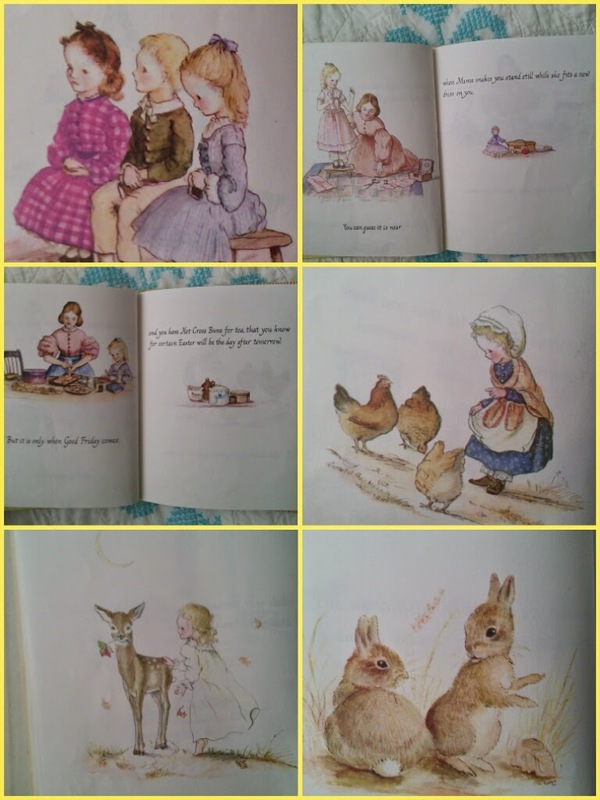 Definitely not many classics, aside from The Golden Egg Book and The Country Bunny & the Little Gold Shoes (which we only got last year). The dream sequence is so beautiful! I wish I would have checked this book out when the girls were tinier. They would have appreciated it more, I think. YOU AND ME BOTH SISTER!! i want to live in a Tasha book. oh this book! one of my great favs! thanks for reminding to go get some hot cross buns for tomorrow! these books are both so enchanting. the loveliest dreams thing? just heavenly. I love the dream! It's my dream Easter, too. I'm not too old to ride on a faun in my dreams, right? Darling illustrations! I have a Tasha book and I just love it to bits! I think her art is so peacefully beautiful. I just love to look at her drawings! You found such pretty books.